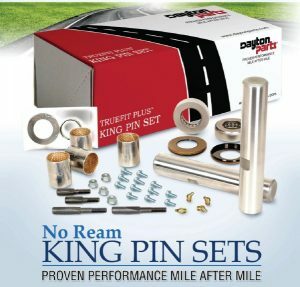 Dayton Parts announces the TRUEFIT PLUS™ line of "no ream" king pin sets. The TRUEFIT PLUS™ series of king pin kits combine the fitment of a reamed king pin installation with the benefit of reduced installation downtime. All kits include bi-metal bronze bushings that are engineered as a perfect match to the king pin - taking the guesswork out of properly reaming your matched components .TRUEFIT PLUS™ king pin kits result in a proper fit every time. The TRUEFIT PLUS™ series of king pins offers ease of installation and pre-sized bi-metal bushings, which have been performance proven, mile after mile, by North American vehicles. The TRUEFIT PLUS™ series of king pins offer the most economical matched fitment of king pin and bushing, without the added cost of reaming. You can depend on Dayton Parts TRUEFIT PLUS™ series of "no-ream" king pins to get you back on the road quickly, saving you both time and money. TRUEFIT PLUS™ fitment and longevity is similar to traditional king pins (matched fit). Since the bushing is designed to match the pin, you will have an exact fit even if the king pin bore has small imperfections. In contrast, spiral bushings can have larger tolerances between the bushings and king pin since the spiralbushing is designed to fit the king pin bore, not the king pin. Improper fitment and loose pins can cause premature wear, reducing the life of your steering components. If not properly lubricated, steel on steel contact will occur, resulting in drastically reduced king pin life.